King Philippe V of Spain has gone mad. Neither his wife, Isabella, nor his doctors can help him. 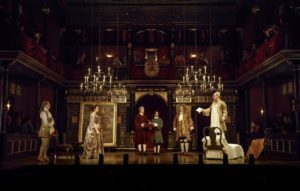 Then Isabella, brings Farinelli, the famed Italian castrato, to the court, and the sound of his divine voice brings the king back to sanity. Such is the slender plot on which musician and academic Claire Van Kampen bases her first play, Farinelli and the King. The fact that the play has made it to Broadway owes much to the casting. 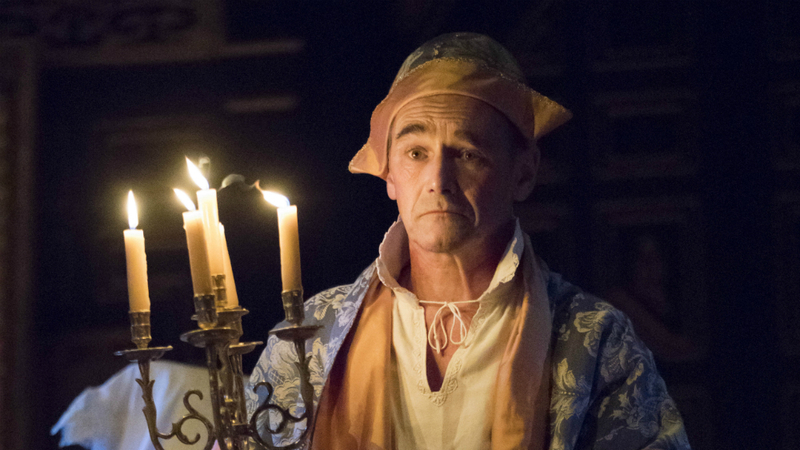 Philippe is played by none other than Kampen’s husband, the extraordinary Mark Rylance, whose cynical sanity brings the king to life. Of course the play has a lot more going for it. Director John Dove is a veteran of the London stage and has worked with Kampen and Rylance extensively. And designer Jonathan Fensom has turned the Belasco stage into a Baroque theater, complete with candlelit interiors, sumptuous costumes and a life-sized horse for the restored king to mount. And then there’s the music. 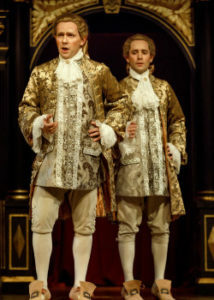 While Sam Crane plays Carlo, Handel’s arias are sung by countertenor Iestyn Davies (and occasionally James Hall), as the two stand side-by-side onstage. Although it’s not clear why Dove made this choice, Crane is excellent in balancing restraint and passion, and Davies could make even the most disturbed among us throw away their tranquilizers. But once the king has been cured, what’s left for Act II? Turns out the king now prefers the solitude of the country to the bustle of the court and refuses to return to his royal duties. What’s more Farinelli (to the surprise of everyone in the theater except the actors) has fallen in love with Isabella (Melody Grove), but they’re both too loyal to the king to become lovers. The play gets some steam from these twists, but seems to lose momentum whenever Rylance is offstage. The intrigues of the court are just not that intriguing. After the king exits for good, only the superb music can keep the audience awake. 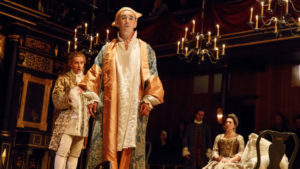 Philippe makes some insightful comments on the lack of choice even the most privileged among us really have: he has not chosen to be king and Farinelli did not choose to be castrated at the age of 10 by his brother. And the play is surely a commentary on the nature of power. However, Farinelli and the King is mostly a treatise on the curative power of music. This is indeed an old story. It certainly goes back to the Bible and the Greeks, and probably to the first man or woman who banged a branch on a hollowed-out tree trunk. Farinelli and the King looks good but it’s not exactly the music of the spheres. Sam Crane, Melody Grove, Lucas Hall, Huss Garbiya, Edward Peel, Mark Rylance.